Golden Beach is the perfect place to enjoy the warm winter of the Sunshine Coast, with endless outdoor and recreational activities to keep even the most enthusiastic traveller busy. 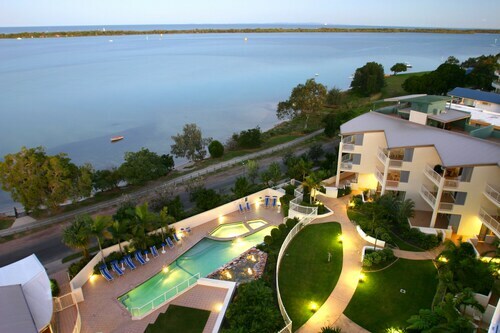 A seaside suburb of the popular Caloundra, the most famous water sport here is windsurfing. Book from our range of Golden Beach accommodation and get a taste of the real beach lifestyle, laidback as it should be. You could spend days on end enjoying the sunshine as your kids play on the white sand beaches, chasing hermit crabs and seagulls. Surfers always head to Moffatt Beach, with its awesome surf break offering some of the best waves on the Sunshine Coast. If you are bringing little kids, the playground at Kings Beach is perfect. With a time-delayed play-fountain, they will spend many hours happily playing between the beach, the fountain and a fenced-off saltwater pool that overlooks the ocean. Once you've had enough sun, a river cruise down Pumicestone Passage is a wonderful way to spend an afternoon. Dad will enjoy a few rounds at Pelican Waters Golf Club, designed by Greg Norman himself. Take the whole family to explore the Bulcock Street Sunday markets, and pick up some local handicrafts and artisan gifts for a great souvenir. Explore the theme parks in the Sunshine Coast, and be sure to have a couple of days to really make the most of them! Watch crocodile feeding and many great nature shows at Australia Zoo, visit Underwater World and dive with sharks or play with a seal, your kids will love all that there is to do. Try Aussie World, right behind Ettamogah Pub, for roller coasters, lots of laughs and gift stores offering the most unique items on the Sunshine Coast. 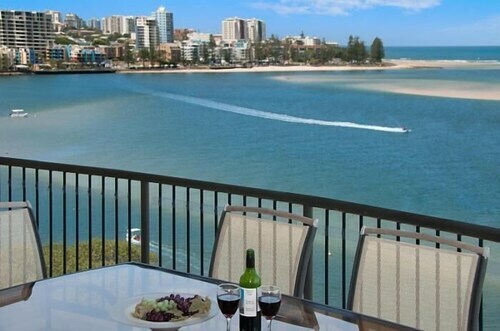 Whatever you are looking for in your holiday destination, the Sunshine Coast has it all. Nature, beaches, hinterland and waterways, relax with a book by the water or get your thrills on a roller coaster. Your family is going to love it, so why wait? Check out our great deals on Golden Beach hotels and start planning your next holiday today. How Much is a Hotel Room in Golden Beach? Hotels in Golden Beach start at AU$181 per night. Prices and availability subject to change. Additional terms may apply. Although the lounge and carpet could do with a shampoo, the one-bedroom apartment we had was perfectly comfortable. Lovely property in a great waterfront location, and with immaculately maintained facilities and gardens. Rebecca was a wonderful host and very welcoming. Highly recommended for those looking for a quiet, no-stress family holiday that’s close but not too close to the buzz of Caloundra. We’ll be back - if there’s ever a vacancy!